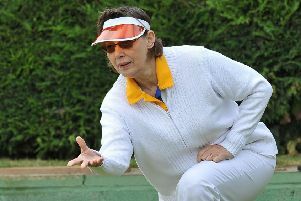 Nicky Brett from Yaxley somehow grabbed defeat from the jaws of victory as he lost on a tie-break to the unseeded Simon Skelton in the semi-final of the World Indoor Singles in one of the most remarkable matches seen at Potters in recent years. 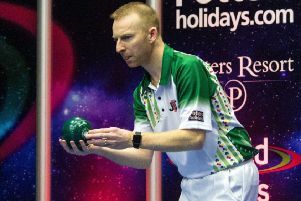 Brett has arguably played some of the best bowls of the tournament in reaching both Pairs finals as well as the semi-final in the Singles, and he started like an express train against a man not expected to feature in the latter stages of the tournament. But the wheels fell off Brett’s bandwagon, while Skelton produced an unbelievable recovery to turn the match on its head and somehow claim an amazing 2-9 8-7 2-1 triumph. Brett was in reflective mood in defeat, saying: “Halfway through the second set, Simon changed the jack length and I lost the pace. He upped his game, he got a good three to get right back in it on the eighth end and the momentum was with him. I had a couple of good bowls after that, but Simon has got in first and I have not really responded. The 2016 champion waltzed thought the first set, winning it 9-2, playing some of the finest bowls seen in the tournament this year and smoothly moved 7-1 ahead in the second with Skelton looking dead and buried. Skelton, though, won end six, switched to a shorter jack and transformed himself from also-ran to dominant force and stormed back into the match. He still had work to do, though, needing six shots from the last three ends to trigger a three-end lottery and Brett still looked favourite to go through. But the Long Eaton ace, who last reached this stage 10 years ago, claimed a treble on end eight and then got a brilliant result on the next springing the jack, with his red bowl rolling nicely towards the respot. Brett could not beat it and the match was prolonged. The Huntingdon Bowls Club man got in first to take the first end and it was advantage Brett, but Skelton clinched the second to take the match to a dramatic finale and held shot on the last with his opponent having one bowl left. Brett’s backhand looked to be on a lovely road in, but it stopped about an inch short and it was Skelton who punched the air in delight as he booked a final spot against Stewart Anderson.